European stone fruit growers finally seem to be making some money again this year. With the exception of Greece, production is much lower everywhere. This is resulting in remarkably good prices for Spanish stone fruit. South Africa is shipping its last plums to Europe, but there is also a lack of understanding among European customers about the high prices. In South Carolina, the harvest volume is back to the usual level after a very low production last year. Spain has a completely different stone fruit campaign this year compared to 2017. While last year's season was marked by oversupply, and this resulted in disastrous prices and yields, this year all producing regions have a delayed harvest and lower volumes, making sales this year smoother, even with some occasional difficulties to meet the demand. For example, Murcia, the largest early stone fruit producer nationwide, was severely hit by rain and hail storms. As a result, considerably fewer apricots, peaches, Paraguayo peaches, nectarines and prunes have been harvested. This had a great impact on other producing regions, such as Seville and Huelva, because the market was relatively empty. Exporters have had problems this year to meet the demand in Europe, as a result of which, exports to third countries have been much more limited. In Huelva, the early stone fruit season (from greenhouses) has been marked by little competition and good prices. "We have faced considerably fewer problems than in other years," explains an exporter. "We thought we had a late harvest, but compared to Murcia and Seville, we were still early. This gave us a lot of room on the market, and since we grow in greenhouses, we are not affected by rain or hail. Prices are similar to last year's, but we didn't have the usual fall in prices in May, and in any case, the shortages are expected to continue until the arrival of the harvest from Extremadura and Lleida. Also, the harvest of the open ground crops has started late and with lower volumes. In Seville, the season started ten days later and also with lower volumes due to rainfall. Seville mainly produces peaches, nectarines and pluots (half plum, half apricot). The campaign will last another three to four weeks. The prices are high compared to last year, after a number of bad seasons in a row. After the end of the campaign, it will become clear whether the good prices compensate for the lower volumes. Extremadura is specialised in plum cultivation and is the most important Spanish producer of this fruit. The harvest is kicking off about fifteen days later this year. This also applies to apricots, peaches and nectarines. A production drop of around 40% is expected, which will result in a shortage of plums. The earliest plum varieties were hit by frost during the flowering period, and the later varieties have been affected by excessive rainfall and hail, which prevented the setting. Also, varieties like the Fortuna, which don't usually suffer any problems, may be facing some trouble. Chile stopped exporting plums a few weeks ago, and the South African season has also come to an end, so there are some gaps in the market. In the next three weeks, there will be shortages anyway and prices are expected to be very high. As a result, the producers and exporters will focus on the European destinations and ignore the riskier overseas destinations, such as the recently opened Chinese market. Extremadura, together with Murcia, is the region that suffered the biggest impact from rain and hailstorms. In view of the storm forecast for next week, there will probably be major production drops again. The fruit harvest in Catalonia is starting 8-10 days later and the production volume is expected to drop by 17% (to 471,430 tonnes). The volume of peaches here is 13% lower (114,250 tonnes) and the Paraguayo peach harvest is expected to be 18% lower (127,560 tonnes). For nectarines, the production is expected to fall by 19% (to 207,310 tonnes) and the Pavia production will fall by 12%, to 22,310 tonnes. This drop in the production is the result of a number of factors, including a long and irregular flowering period, followed by problems with the fruit setting. Also noteworthy is the impact of the night frosts in February and March, especially for the early varieties, as well as the hailstorms in April and May. Given the lower number of fruit pieces per tree, stone fruit sizes are expected to be larger. Furthermore, there has also been a 2% reduction of the acreage devoted to ​​peaches and nectarines. That devoted to ​​flat peaches has also fallen, while that planted with round peaches has actually expanded. A delay of about 15 days is reported in Aragon. The total stone fruit production is expected to be about 15% lower. Only cherries escaped this trend, as their production volume is increasing. The Italian stone fruit market is struggling with the consequences of the weather conditions and the difficulties to increase the consumption levels. But given that the volumes available in 2018 are lower than those of 2017, there is currently some optimism on the Italian market. The production forecasts for peaches and nectarines confirm the decline announced in early May. In total, a production of 3,670,000 tonnes is expected; 8% less than in 2017. Ignoring Percoca peaches, which are mainly intended for the processing industry, the drop actually increases to 11%. Greece is the only country with an increase in production volumes (+20%), but the effect of this on the European market will be limited, because this increase mainly concerns the aforementioned Percoca peaches. Italy expects a 16% drop compared to last year; in the south, this percentage actually exceeds 20%. There are also fewer problems with selling smaller-sized peaches and nectarines, because sizes are mainly large (A, AA, AAA). Incidentally, there is a good demand from Poland and Scandinavia for medium and small sizes. Sales are going reasonably smoothly and no major changes are expected for the next two weeks, unless extreme weather conditions are recorded. In order to make it possible for the campaign to last from early May to October, the nectarines from Campania are grown in both greenhouses and in the open ground. Traders are not concerned about the Spanish supply, but Greek exporters are adopting a more aggressive marketing strategy. The Italian market is a net importer of Saturn peaches (Paraguayo peaches). Although traditional peaches are losing their appeal for Italian consumers, these flat peaches continue to do well. Also, they often have a more uniform taste, unlike traditional peaches, whose taste is more variable. In the first years, Italy developed a number of successful Paraguayo peach varieties, but the market is still dominated by Spain. The Platerinas are not managing to reach the same level of success and they only account for 5% of the flat segment. Meanwhile, production in the Italian region of Marche has started with small volumes. This season will come to an end around 15-20 August. Lower volumes are expected due to losses in the early segment. Since the apricot production is 30-40% lower than last year, a better start is also expected here. The harvest is in full swing in the south of Italy, and in the north, it has only recently started. The rain showers of recent weeks have had some impact on the fruit's organoleptic quality and, as a result, the consumption is somewhat lower. Now that the sun and high temperatures have returned, there are hopes for a market recovery. Most losses are recorded in Basilicata, due to the frost of late February. The red apricot season has kicked off in Calabria. Despite the rain and frost during the flowering period, the production volume is comparable to that of 2017. The harvest of the early varieties Pricia and Tsunami started on the Sibari plain and soon the Orange, Orange Rubis and Rubistà will be ripe. The season will end in July. Lastly, it is worth noting that things are going well in the Italian cherry market, although the climate has taken a toll on the early production. There is, however, no lack of demand. The season is at its peak in Puglia with the top variety Ferrovia, which is an excellent quality cherry. Prices for the fruit were not bad at the end of May 2018. The early Bigarreau cherries still had some cracks, but the Ferrovia and Giorgia varieties are of better quality. However, traders complain that the situation of the cherry market is not as good as that of other stone fruits. In recent years, the acreage has increased considerably, and this is not making cherry sales any easier. "Due to the weather conditions, the situation on the French market has been tough so far," says a trader. "We have almost never had such a bad May, with rain, hail, temperature fluctuations and wind, which have slowed down the production by 15 days. Sales have not recovered from this yet." "The fruit is of good quality and has a good size, but the consumption is still very low. Given the limited production, everyone expects the prices to rise quickly. Peaches have been becoming more expensive again since a week ago. The sales price now oscillates between € 2 and € 3, depending on the size and the variety." "Apricots remain popular in France. The first Spanish varieties that hit the French market were not yet at the right point in terms of taste, but the quality is starting to improve, and the French production will soon be available, too." After the weather conditions severely reduced the harvest of 2017, South Carolina has started the current season with a large volume of peaches. "JW Yonce, of the Johnston production company of the same name, tells us that they have started earlier this year following a cool winter with a healthy bloom, which turned into a warm spring. We started packing on 1 May and expect the season to last until 15 September. After the 20% drop in the production that the region recorded last year, normal volumes are now expected again. The quality of the fruit looks good and the taste is also good, and the size grades are also starting to increase. The early fruit was still small in calibre, but now that June has started, all sizes are being packed. At the same time, the demand is strong. Yonce even calls it surprisingly good, since the summer has not yet started and the demand often erupts in the second or third week of June. At the same time, California is also supplying peaches, providing a wide range of sizes. The early harvest from Georgia was limited, but there is now more movement expected on the market. The prices are at a level comparable to that of 2016. The packer highlights that there has been a steady supply and that the supply and the demand have been in good balance. Although the company ships stone fruit to New York, Detroit and Chicago, the packer is also setting its sights on the south this year. The reason for this is the increased freight costs and the new truck legislation that forces the product to arrive later at its destination. Currently, the last volumes of South African plums, mainly Angeleno and Flavor Fall, are being shipped, but some major exporters have already put an end to the season. South African plums have had a good spring and autumn. The volumes fell when demand was very high. However, at the end of the season, there was some resistance on the European market against the high prices. As a result, some exporters decided to avoid certain European destinations and to meet only the British supermarket programs. The season of other stone fruit varieties, such as peaches, nectarines and apricots, has already been completed. The supply and the demand are currently very unbalanced in the German market. Due to the unfavourable weather conditions in southern Europe, there is a dramatic shortage of apricots, both from Spain and from France, where the season has also started about 10 days late with the Colorado and Pricia varieties. From Spain, however, there is a greater supply of Red Orange. The French fruit is currently about 40 cents per kilo more expensive than the Spanish. Compared to last year, the prices per kilo are about 50 cents higher. As far as nectarines and peaches are concerned, there is a shortage of large sizes, which are, however, very popular in the German wholesale markets. Within the retail sector, however, relatively small fruits (such as the Morena variety) are sold well in various packages. The supply in this segment is also almost exclusively from Spain. Also, Paraguayo peaches are again on the market, with prices currently amounting to around 2.60 Euro per kilo (AA). After an extremely bad stone fruit campaign in 2017 in terms of prices, the situation appears to be the complete opposite this year, according to a large Dutch importer. He speaks of high prices across the board. "The supply of Paraguayo peaches is reasonably normal. The situation on the peach market is now also slowly going back to normal, as the seasons in Italy and Badajoz are gradually hitting their stride, but it has been particularly good so far. Plum production has also slowed down and nectarines remain a hot item. Consequently, the prices for the packaged product are considerably higher (0.60-0.70 Euro per kilo) than last year. And with the current sunny weather, stone fruit is selling like hot cakes. The supply from Murcia, which otherwise could cause some disruption on the market, has been gone for two weeks and was also hit by frost. Seville had a reasonable harvest and benefited from this, but there are still huge shortages in Europe. All exports following those from Seville and Murcia have been delayed by two weeks, so the exporter expects the market conditions to remain good. All in all, the production is considerably lower (-25%), but the year could finish with nice results when it comes to prices. So far, the stone fruit season has been going well thanks to the good weather in Belgium. Yet the supply is not very large, especially in the case of nectarines. For the yellow nectarines there is even a small shortage. The relatively small supply is a consequence of the moderate weather in Spain. The prices for the stone fruit, depending on the brand and calibre, are quite high. They oscillate between € 2.80 and € 3.50 per kilo. The quality is currently very good. The prospect is that sales and the supply will increase again in the coming weeks, but that will also depend on the weather. After a late start, the Israeli stone fruit harvest is now in full swing. Cooler periods at the end of the winter, in combination with heavy rainfall, pushed the harvest to the end of April, but according to the first reports, there is no damage to the production. 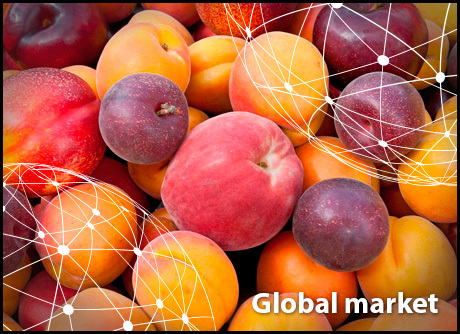 Although the production volume is not expected to suffer from the late start, the export potential of Israeli stone fruit will be affected, because exporting to Europe is only feasible in the beginning of the season, before Spain hits the market. In that sense, a later start of the Israeli season entails disadvantages in terms of both export prices and volumes. As a result, prices on the local market are currently slightly lower than in previous years. Apricots are sold for 4-5 Euro per kilo, plums for 5-6 Euro per kilo, and peaches and nectarines for 2-3 Euro per kilo. A reasonably stable market is expected for the coming weeks. Peaches and nectarines account for about half of the consumption volume in Israel, followed by plums and apricots. After a few good years for stone growers, 200 new hectares have recently been planted, which will become productive in the coming years. To prevent a situation of oversupply, the Israeli Ministry of Agriculture has set up a program to encourage growers to focus on the export market wherever possible. The program includes grants and advice to growers who work with early, high-quality varieties for export to Europe and the United Kingdom. The Australian stone fruit season has been better in terms of timing and quality than that of the previous year. The domestic demand was not great, but the fruit's taste and size still attracted some consumption. The supply of peaches was quite large, which resulted in a low yield for the growers. Nectarines were readily available, but there was no oversupply, while there were fewer plums than in the previous season and the apricot yields were slightly lower. Nectarines continue to dominate sales on the Australian market, with yellow nectarines preferred over the white. Exports of Australian stone fruit rose by 167% in terms of volume last year compared to a year earlier, mostly thanks to the new protocols granted for peaches and plums, which have given them access to the Chinese market, and which follow those granted to nectarines a year earlier. Apricots also have access to this market, but as this is a rather delicate fruit, improvements in the market protocol are needed in order for Chinese consumers to have access to a first-class quality product.